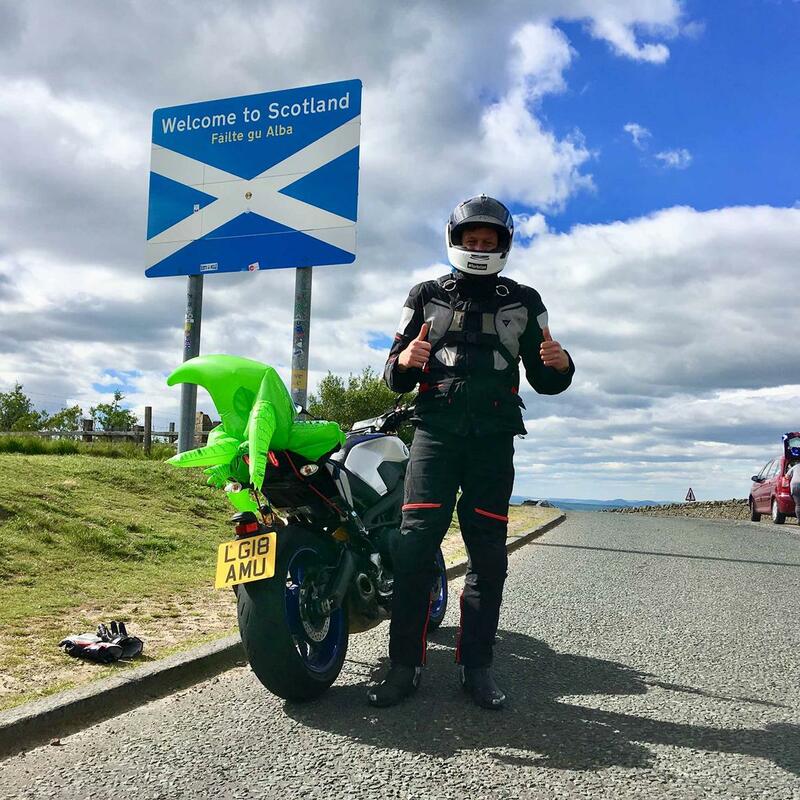 Over the last six months our Yamaha MT-09SP test bike has been subjected to everything from 900-mile days, to commuting to fast-group trackdays. The A9 out of Inverness, fast, flowing and magical. The dying embers of a mid-summer sun cast 100-foot MT-09-shaped shadows over shimmering lochs. I’d ridden up from Land’s End that morning. I was tired and emotional. Bike was fine. 903 miles in 20 hours from Land’s End to John o’Groats. Neck. Below 80mph wind blast is more than acceptable for a naked, above that it is, quite literally, a pain. I cracked the front nose-cone panel when my drill bit picked up on the plastic while fitting the official Yamaha screen to alleviate the above neck pain. I’m not the only one – there is still no stock in dealers. Cost: £26 for a small bit of plastic. A sportsbike-slaying trackday at Cadwell Park – the pace and punch that the MT-09 SP demonstrated was impressive, but it was the playfulness and sense of fun that I’ll remember. Sheer joy. There has been none – it’s been sheer heaven. From start to finish. What do you most admire? Its Kayaba front forks. Multi-adjustable and adaptable to any situation they show up the cliché of the quality of the Öhlins rear shock to be just that – a cliché. The CP3 engine is obviously a masterpiece, too. What’s it really good at? Charging down the B1090, flicking from side to side and revelling in its alacrity and response. You feel engaged and invigorated, but never stray past 100mph. It can do almost everything – its only real weak point is big trackday lean, not a problem for road riders. But this can be fixed by removing the hero blobs, or fitting the optional Yamaha rearsets. What’s broken or fallen off? Nothing, the build quality and finish is very good – far better than a KTM 790 Duke, for example. There is nothing that winds you up – everything is well thought-out and brilliantly developed. Tell us a secret about your bike? The MT-09’s monoblock caliper used the same pattern brake pad as a 1998-2006 R1, meaning a great choice of upgraded pads. The suspension as standard settings are awful – and far too hard for road riding. The ‘soft’ settings in the manual are a very good starting point. Have you mastered its electronics? There is nothing to master – leave throttle response in standard setting (mode A is too abrupt) and TC in level one (it only interferes on the limit, on a track) and it’ll do everything from Rockingham to a rainy ride home. What did you think of your bike at the beginning of summer? I was intrigued to see if after 15 years of continual sportsbike ownership an MT-09 SP was satisfying enough for an experienced, performance-minded rider. I now know it is. Update 4: What does a year's MT-09 SP riding cost? Six thousand miles on Yamaha’s MT-09 SP in the best biking summer for a generation has, understandably been a joy. With the kind of brawny, off-beat power delivery that somehow works in every situation, it’s despatched everything from the 900 miles of Land’s End to John o’Groats, to commuting, to trackdays. In fact, it’s been so impressive thatI’ve only done 600 miles on my R1 in the same time. In my opinion, for everything aside from very fast track riding, bikes like the SP make more sense to own than a sportsbike. But while my classic R1 goes up in value by a larger amount than I pay for insurance and servicing each year, a new bike isn’t quite the same. So, what would a brilliant year’s biking really cost? Depreciation: £2499 Back in April, the SP’s OTR price was £8999 and now, six months later, low-mileage used bikes are currently up for sale at £8000 in dealers. However, my mileage isn’t low – so I’d advertise it privately at £7000 and hope for a £6500 trade-in deal at a dealer. Fuel: £670.42 Over the last 5895 miles the MT-09 has averaged 50.3mpg – impressive considering that includes fast weekend rides, three trackdays and lots of town work. On a long motorway run hovering at the speed limit it’ll see almost 60mpg. Incidentally, petrol prices have gone up from 121.4p/litre in April to 130.6/litre at the end of October. Consumables: £594.29 Tyres are the main expense here. The OE Bridgestone S20s were square by 1500 miles and re-placed by Michelin Power RS (£280 fitted) which lasted more than 3000 miles, before being re-placed by Pirelli’s Diablo Rosso Corsa 2s (£305 fitted). I also tried some Dunlop SportSmart TTs, but don’t count these as it was part of a tyre test. The MT-09 has used no oil at all over that time and the brake pads still have life in them despite 6000 miles and three trackdays. Chain and sprockets are wearing well, with Motul C2 chain lube (£9.29) doing a good job. Damage: £373 The MT-09 got knocked over while parked. The damage is: £163 crankcase cover, £80 oil pump cover, £24 indicator, £57 front brake lever and £49 r/h mirror. That’s £373 and, if you go to a deal-er, at least an hour to fit. Servicing: £298 The SP is due its 6000-mile service which includes an all-over check, oil and filter replacement and diagnostic check, costing £199. Its previous service was at 600 miles, where the oil and filter was changed during the running-in process. This costs around £99. Insurance: £144 The relatively-low insurance group for the SP is a big saver here – and in comparison, a new R1 would cost £377 for the year. Prices are from mcncompare.com and are based on my own circum-stances, so that’s a 38-year-old living in Cambridgeshire with a full licence for 20 years, four years no claims and three points on his licence. Grand total: £4578.71 (less depreciation: £2079.71) Ignoring that depreciation figure, the amount is actually quite palatable – and could be reduced further still. My tyre choice fitted my Fast Group trackday needs, but if you’d replaced the OE tyres with a set of decent sports touring rubber and didn’t go on trackdays your second set would still be going strong. Then if you discount the damage, you’re looking at £1401.71 for 6000 life-affirming miles. Compared to something like a new 1000cc sportsbike, the MT09 SP's running costs are low. It is around 50% more fuel efficient, costs 60% less to insure and is much kinder on tyres, chains, sprockets and brake pads. Set against that, MT-09 SP is one of the best-value new bikes around – and it can turn its hand to anything. Update 3: Which tyres work best on the MT-09 SP? Yamaha’s MT-09 SP is a lovely motorcycle that as standard is only dragged down by two things; the harsh out-of-the-crate suspension settings and the poor quality of the OE tyres. Japanese manufacturers are notorious for driving very hard bargains when it comes to OE rubber while at the same time having very specific requirements for things like longevity and stability. The end result is that the stock Bridgestone S20s are very different from the ones you’d buy from a dealer; right down to compound and construction. Simply, they let down a brilliant bike. Slow to warm up, they offer very little in the way of feel and unnerve you in the wet. However, in the dry on an abrasive road surface they offer enough grip and I found their inherent harshness was reduced if I lowered rear tyre pressure to 36psi. But there was a price for this. After 1500 miles they were starting to square off and handling deteriorated rapidly, picking up on camber changes and needing more effort from the bars. My replacement was Michelin’s Power RS. Designed as a fast road tyre that Michelin claim can handle decent track use, they fitted the bill perfectly. A multi-compound tyre, they follow the tradition of a silica-rich, harder centre and softer edges with very little tread. Handling was instantly improved. Ride-quality, steering and chassis feel moved a step forward, imbuing the MT with a weightless quality and giving the confidence to use the triple’s joyous torque on corner exits. They’re surprisingly good in the wet, too. On track, it was much of the same; although Cadwell Park on a very hot summer’s day meant localised overheating when I pushed really hard, but even then they remained friendly. Best of all, they lasted more than 3000 road miles after the trackday and, although they’d started to square, the bike still handled well. Since then I’ve also tried rival Pirelli’s Diablo Rosso Corsa II and Dunlop’s SportSmart TT. 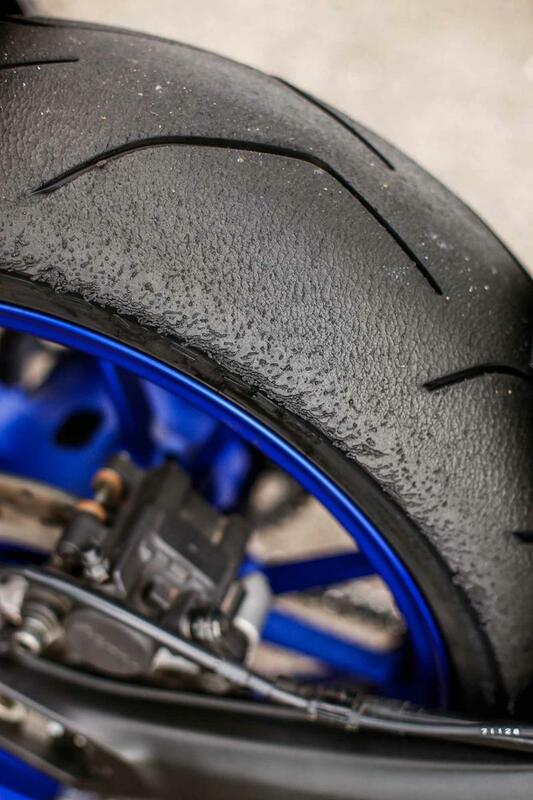 Both are slightly grippier track tyres but the Yamaha doesn’t steer as well on the Pirellis and the Dunlop’s stiff carcass means its on-road ride quality is worse. But if you own an MT-09 SP, any of these three will help unlock its true potential. The SP looks stunning for a £9k bike. This is the performance version of the MT-09 with a fully-adjustable KYB fork and Öhlins shock. I’ve always been impressed with the MT-09’s power delivery so it’ll be interesting to see what it’s like with proper suspenders. That set-up needs some work. There’s nothing wrong with the suspension’s quality; it’s just that the standard settings are too stiff. This affects stability and doesn’t allow enough weight transfer for good feel. The recommended soft settings are dialled-in and work well on the road. The rear shock’s preload, rebound and compression can be adjusted by hand, but you need a 4mm allen key, two spanners and a screwdriver for the front. Time for the first service. Running- in hasn’t been a hardship. Even limited to 6000rpm there’s enough grunt to blast past traffic. However, the chain needs adjusting, slipping 10mm over the maximum free play. I lend it to a photographer on an MCN sister title who promptly knocks it off its sidestand. The damage is: £163 crankcase cover, £80 oil tank cover, £24 indicator, £57 front brake lever and £49 r/h mirror. That’s £373 and, if you go to a dealer, at least two hours to fit. Its first trackday at Cadwell is glorious thanks to its light steering, and the eminently-usable 847cc triple. I’ve just fitted new Michelin Power RS tyres which work well, giving loads of grip and resulting in duffed pegs everywhere. Trackday riders should opt for Yamaha’s £335 rearsets. I also try a KTM 790 Duke, but the Yamaha has better fuelling and a stronger engine. I’ve ridden from Land’s End to John O’Groats in a day for charity. That’s 909 miles, no motorways and 19 hours of riding. The SP was surprisingly comfortable for a naked bike: wind protection is good at 70mph and the tank good enough for 140 miles between fill-ups. Average mpg is 52.3. I arrive home having covered 2000 miles in three days. Eight hours of it is night riding and the MT-09’s LED headlights are among the best I’ve used. My neck’s sore from the windblast but the SP has delivered impressive comfort. I’m back on the bike the next day. I try Yamaha’s comfort seat, a £251 option. It’s wider by about 30mm, and taller by about 10mm, but doesn’t actually give extra comfort and it chafes your inner thighs. A week off has given me more time with the SP. We spend it charging along B-roads, revelling in the power delivery and it culminates in a track day. It’s impressed: the control and feel from the new suspension has broadened the MT’s appeal from post-test chariot to a bike that can satisfy any rider. Light, nimble and economical, Yamaha’s MT-09 has proven to be a great long-term companion, so far. The last 4000 miles have proved Yamaha’s premium middleweight to be fast, frugal and most importantly, fun. Introduced this year as a halo version of Yamaha’s three-cylinder naked range, it offers great value for the more discerning naked addict. At £9199, the SP is just £800 more expensive than the Yamaha MT-09, but for that you get smart blue and silver paint (not all grown-ups like fluro), fully-adjustable decent-spec KYB fork and an Öhlins rear shock. It’s a compelling package, and time in the saddle have proven its equal worth as a commuter, B-road tool and track bike. Minimal mass, a torquey, responsive motor and quality suspension are always the best recipe for fun. At a measured 196kg fully-fuelled, it’s only half-a-tank of gas heavier than a Triumph Street Triple 765 RS, but its slight capacity advantage more than makes up for it. It’s only above 9000rpm that it loses anything to the more highly-tuned Triumph. Once I’d softened up the suspension (the stock settings are abysmal), on congested B-roads where I seem to spend most of my time the bike delivers sublime ride quality and the most neutral, confident steering. It’s confidence-inspiring skills brings out the best and worst in your riding. As a sportsbike refugee with more than 100,000 miles on Yamaha R1s, BMW S1000RRs, Ducati Panigales and Kawasaki ZX-10Rs, it’s surprising that the SP has made me rethink my love of ludicrously-powerful sportsbikes. That 847cc triple is an off-beat pleasure and the hardening of its engine note as it drives though the midrange into a wailing top-end is addictive. And you can get much closer to using its potential than any sports 1000. Bikes like the Yamaha MT-09 are used as commuters and in this role, it excels as it is light, nimble and very economical. The riding position is perfect for weaving in and out of traffic and that warbling, aggressive power delivery allows you to nip though gaps and despatch lines of traffic with arrogance and ease. An average fuel consumption of 48.7mpg means a range of 130 miles. Predictably, wind protection is pretty poor, but if that bothers you, buy an aftermarket screen, or a Yamaha Tracer 900. The SP combines a devil-may-care attitude with a brilliant engine and a level of finish that’s very impressive for the price-point. If you’re an experienced rider, some middleweight bikes can feel like they’re talking down to you, but not this one. But it’s not perfect out of the box. To realise its potential, you need to bin those stock tyres and back off the suspension to soften up its action. Neither thing is a big hardship, although Triumph’s Street Triple is fine straight from the showroom. Just a few little tweaks are enough to make it a proper, do-it-all bike – for wherever your riding takes you. 1. The tiny, off-centre digital dash provides all the information you could need, from mpg (it’s accurate to within 1.5 mpg) to ambient air temperature. And it feels classy without the expense of a TFT dash pushing up the price. However, it could do with a shift light and the constantly-illuminated quickshifter light is unnecessary. 2. The tyres aren’t great in the damp and cold, but on summer roads they’re not that bad. However, they shouldered at just 1500 miles and the loss of profile ruined the handling. The new Michelin Power RS tyres are a huge improvement. 3. The excellent KYB fork is adjustable for high and low-speed comp as well as rebound, while the Öhlins STX46 even has a remote preload adjuster. The ride-quality and feel at both ends is impressive and Yamaha’s ‘soft’ settings (in the manual) are ideal for B-road Britain. Have a browse for your next bike on MCN Bikes For Sale website. First ride video: MT-09 gets suspension it deserves, but is it the full SP? Win a place on the MT-09 European launch in Croatia! MCN Fleet: XSR900 v MT-09 - which wins the beauty contest?